IT Information Security: As our CIO Diane Bryant says “Intel’s success is based on our intellectual property”. 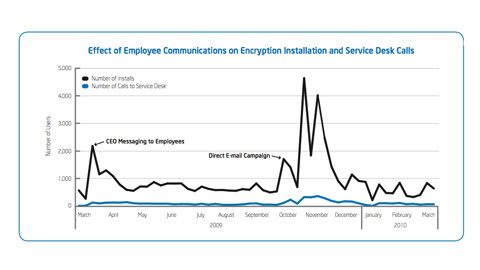 To help protect this valuable resource and employees’ personal information, in 2009 Intel IT began deploying full disk encryption on all corporate-owned laptops provided to employees. With this approach, the entire disk drive is encrypted, including data, applications, the OS, and free space, so that if a system is lost or stolen, malicious individuals cannot access data. Read about how we successfully planned and managed our deployment of this technology, and the benefits we see. Intel.com, LinkedIn, or follow him on Twitter.